Give Your Carpet a Hairwash! 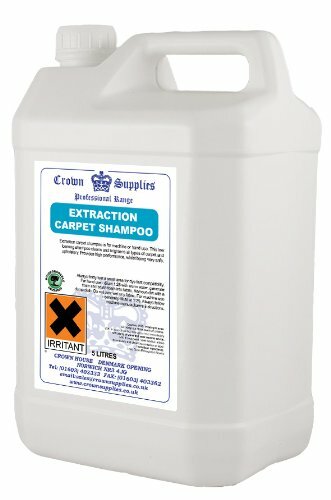 Carpet shampoo can be used on its own, either neat or diluted with warm water, or in an electric carpet cleaner. Carpet shampooers operate like upright vacuum cleaners, but deposit a mixture of hot water and carpet shampoo as they go, cleaning stains, ingrained dirt, and freshening the carpet with the same amount of effort as is involved in vacuuming. You'll need to think about whether you just need to spot clean some awkward stains, in which case you probably only need a small bottle of spray shampoo, which can be used neat, with a damp cloth, or whether you'd prefer to do all your carpets (to get that fresh, new-carpet feel), in which case you're going to need a large volume of carpet shampoo, designed for use in an electric carpet cleaner. Different carpet shampoos have different drying times – if you have pets or children, for example, you'll want a low-foam, quick drying carpet shampoo, so you're not having to keep people and pets out of rooms with damp carpet. Finally, consider whether a pleasant after-scent is important to you, as not all carpet shampoos are fragranced, and some do smell quite unpleasant as they're drying. This is designed for use in carpet shampooers, and has more than enough to last through three or four cleans of a large house. It is fragrance free, and suitable for use on all types of carpets, rugs, and upholstery. It is low foam, and therefore quick drying. While it provides good basic cleaning, it doesn't seem to perform that well on heavy stains. If you just want to freshen up your carpets as part of your weekly clean, this is a good purchase, provided you have a carpet shampooer – it is compatible with most makes. However, if you are doing heavy cleaning, it isn't really effective on stains. This can be used with all Vax carpet cleaners, but is not advised for other makes. It is safe for use on delicate carpets and fabrics, and is low foam, meaning it dries relatively quickly. It neutralises odours, rather than just cleaning the fabric, and is therefore good if you have dogs, who can leave their odour in just about everything! It does tend to give off quite an unpleasant smell as it's drying, but this quickly fades. If you have a Vax carpet cleaner, this is the recommended shampoo to use with it. It performs well, and is a good purchase, rather than just another way for a company to make money. This is designed for by-hand spot cleaning of stains. Apply the shampoo, leave for a couple of minutes, and clean with a cloth dampened in hot water. Obviously, this can be quite labour-intensive, but is relatively simple, and doesn't take much time at all. Do bear in mind, this is for spot cleaning, not whole rooms. Useful to have around the house for quick spot cleans. As its size suggests, this is more for spot-cleaning than full rooms, although there's more than enough to freshen a three-piece suite, cushions, and mattresses during the weekly clean. It is a hand-use carpet shampoo, so you don't need an electric carpet cleaner. Being in a spray bottle, it is easy to direct precisely at stains. It also kills damp and mildew, so can be used for treating affected clothes. A good addition to the household cleaning cupboard. A wool safe, pet-friendly carpet shampoo which can be used in all makes of electric carpet cleaner. This carpet shampoo cleans and deodorises, leaving your carpets clean and fresh-smelling. 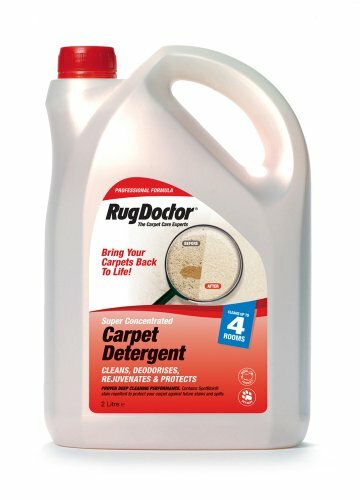 For those who already have a carpet cleaner, this is an ideal addition, which will help leave your home clean and fresh. Newer PostDo Vacuums Kill Spiders?